If in doubt call a proffessional!! So this is a pump, There are several colours, Red,Blue,Green, and silver. 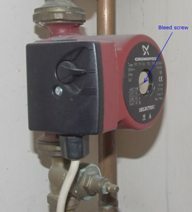 The pump will often be located by the boiler, in the boiler or by the cylinder. 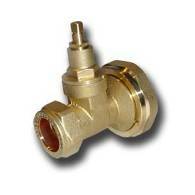 The pumps sole function is to circulate water around the heating system. Pumps, if well treated will last a very long time. 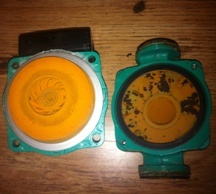 Once you have replaced your pump you will know why it failed, and you must remedy the cause as well. This will usualy be air or scale in the system. one just a screwdriver slot. 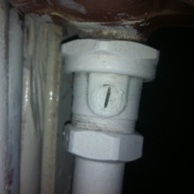 My advice is to totaly drain the system if its the screwdriver type - they tend to leak. If you have the square ended type, get a set of grips and rotate the shaft clockwise, much like closing a tap. Once resistance is felt (usualy 2-3 full turns) nip it another 1/8 of a turn. Do the same for both valves. Electricaly Isolate the pump, disconnect the wiring, make safe. Firstly, there is a caution to this - A seized pump will be full of scalding steam, be careful!. So, With a Large flat bladed screwdriver, (or a 20p peice in a pair of pliers) loosen the silver screw in the center 1/2 a turn, then carefully remove. There should be no significant flow of water. Loosen all four allen bolts around the pump by 2 turns, they should be in place but have 2mm of thread showing. get a cloth to catch water - an old towel is ideal. as you seperate the pump halves about a litre of water will escape. Place the allen key used to open the bolts within easy reach, and carefully prise the front of the pump away from the back. as it starts to split, let the water drain in a carefull fashion. once it stops, remove the four allen head bolts and remove the pump head. If it all starts to go wrong at this point, and the water flow does not stop, retighten the pump bolts with the handy allen key. Dismantle your new pump and just fit the head or Replace it all. 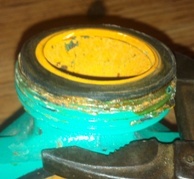 Once you start to mess with the pump valve connections there is no going back. BTW, this assumes your new pump head fits the old body - usualy wilo fits wilo, grundfos fits grundfos etc... Personaly, I look to see if the pump valves and connections are healthy, (i know this sounds stupid but) if there clean and nice, I change the whole pump, if old but not leaking I change the head only. It also depends on how easy it is to swing a big wrench where the pump is. If you just change the head, then seperate the new pump, check it fits, and screw it on with the four allen bolts. So, to change the whole pump, you have to unscrew both pump valve nuts - the ones closest to pump - there big and getting a suitable wrench is not always easy. You also have to do this without straining the surrounding pipes. THATS WHY WE TOOK THE HEAD OFF FIRST. 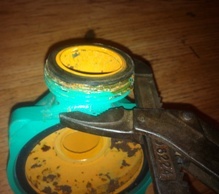 Grip the pump body with one wrench,(no way to grip a whole pump) the nut with the other. Turn against yourself not the pipework. The pump is now free. You now need to check the pump washers that came with your new pump. The choices are rubber or hard fibre. get the new pump and offer it up to the gap the old pump left. make sure you have it the right way up - look to see which side the old pump has dust on if you have forgotten - dusty side is top - and you will usualy find there is only enough space to easily fit one washer! fit the bottom one - carefully, making sure its centralised. fibre washers - smear with plumbers mate - rubber ones, leave alone. 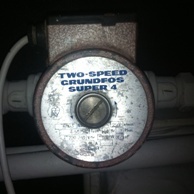 NOTE - the picture here is an old style grundfos, see note at bottom. Do not re use washers that look like this! Have a backup plan... if you cause a leak, be ready to drain the system.